Created in Barbados in 1703, Mount Gay Rum is made with pure, coral-filtered spring water, the finest sugar cane and the knowledge of generations of Master Blenders. The result is a rum of exceptional smoothness and elegance, prized all over the world. Try it in this classy, mellow cocktail. 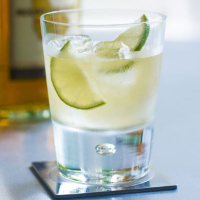 Shake the rum, lime juice, Cointreau and sugar syrup together with ice. Fill a tumbler with ice and strain the drink into it. Decorate with lime slices.